Melodee grew up in the Encinitas area, rode in the show jumping “A” circuit and has been associated with Ranch and Coast Equine for many years. Melodee initially completed her undergraduate education at Washington State University, Pullman and obtained a Bachelor’s degree in Animal Science. 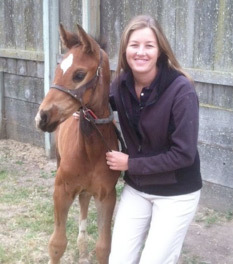 During her undergraduate education, she developed an interest in equine reproduction which lead her to pursue a Master’s Degree in Agricultural Sciences at California Polytechnic State University, San Luis Obispo. Melodee later completed her Veterinary Degree from Western University of Health Sciences, Pomona. As a veterinary student, Melodee was highly involved with the student chapter of American Association of Equine Practitioners where she acted as the student chapter president. Additionally, Melodee had the opportunity to travel to a variety of well-known veterinary clinics throughout the US and Europe which have given her a variety of unique experiences. Immediately after graduation, Dr. Ingram completed a general practice internship at Steinbeck Country Equine Clinic in Salinas. Here she developed a large skill set in a variety of areas of veterinary medicine ranging from emergency and critical care, internal medicine, orthopedics to diagnostic imaging and all other areas of equine sports medicine. Throughout her career training, equine sports medicine has always been her emphasis and practice focus. Outside of her career, Melodee enjoys spending time with her husband Jon and their Boxer, Titus on the beautiful beaches of San Diego.